Elvis Presley's Gibson sunburst LG1 acoustic guitar that he used and played in his MGM film "Girl Happy". The MGM stamp appears inside the guitar. According to his Charlie Hodge, who kept most of Elvis' guitars guned and ready to be played, most of the time Elvis would keep the guitar from the movies he played in and he especially like the Gibson guitars. Elvis kept this guitar later gave it to Charlie. Charlie first met Elvis when he was with a group called the Foggy Mountain River Boys. He and Elvis met again when Elvis was going to Germany for the Army. Elvis and Charlie became close friends and Charlie lived at Graceland in a converted apartment Elvis made for him and lived there until Elvis' passing n 1977. In addition to handling Elvis' guitars, Charlie was Elvis' stage director and sang harmony and played guitar on stage with him, as well as handing Elvis his scarves. 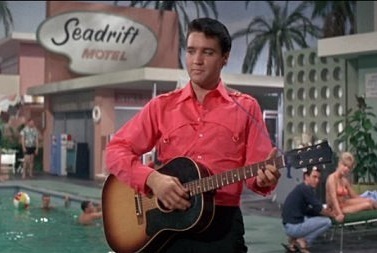 He helped Elvis with the set lists for the shows and also appeared as an extra in many of his films. Very good condition. Comes with a letter of provenance from Charlie Hodge and a Gotta Have Rock & Roll™ Certificate of Authenticity.